Top community discussions about SHAZAM! Is there a better alternative to SHAZAM!? Is SHAZAM! really the best app in Tutorials category? Will SHAZAM! work good on macOS 10.13.4? SHAZAM is a collection of simple scripts for beginning scripters. Conveniently, some of them also show off the "Gee Whiz" factor of a Mac, to impress your Windows-using friends. 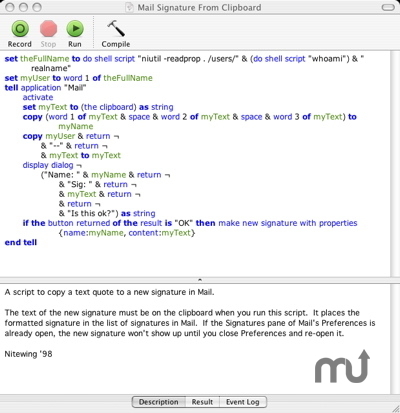 All scripts are editable and have comments that describe how to use them. Scripts included for iCal, TextEdit, Mail, iTunes, and the Finder! Added scripts for Folder Actions, graphics conversion, others. Collection no longer has scripts that require the Nite Flite library. See more reviews for SHAZAM!